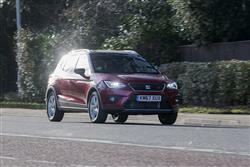 SEAT's Arona is a small SUV with an important role to play in the Spanish maker's model line-up. Jonathan Crouch takes a look at what's on offer. 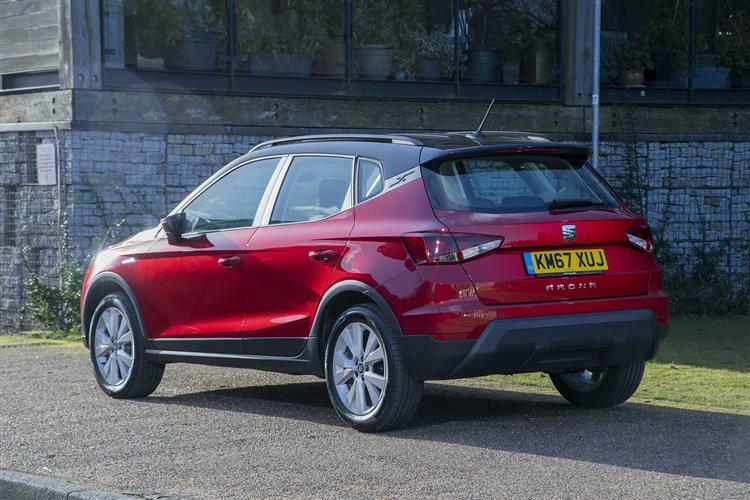 SEAT's conquest of the SUV segment continues with his Arona. 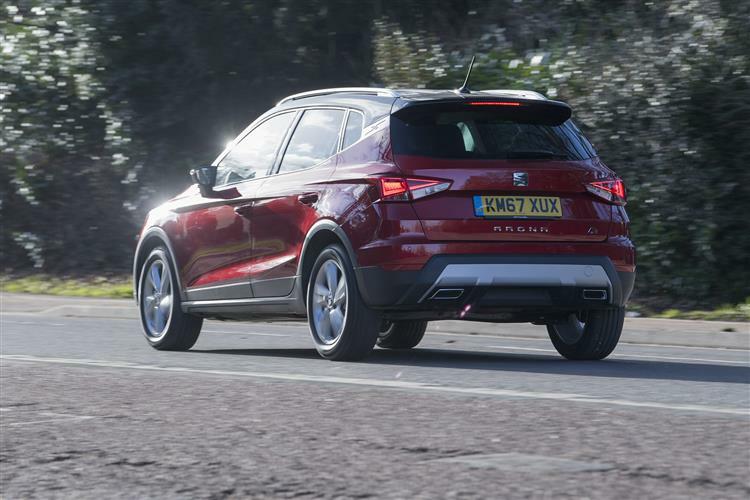 It slots into the Spanish maker's line-up just blow the successful Ateca model, which is based in the running gear of the company's Leon family hatch. The Arona, in contrast, is a supermini-based Crossover, so shares its oily bits with the Barcelona marque's Ibiza supermini. This car was developed as part of the 900 million Euro investment set aside to create the fifth generation Ibiza. It targets a compact crossover segment which has increased four-fold in size since 2015 and claims to bring to the sector the 'sports DNA dynamism' that SEAT hopes characterises its brand. 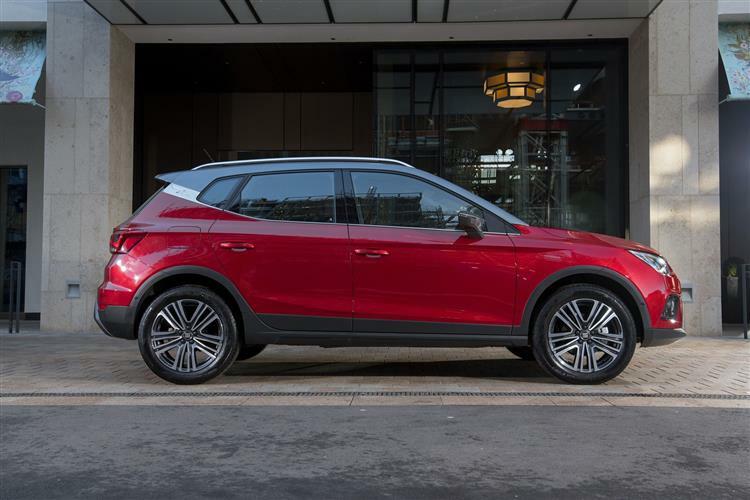 As expected, the Arona shares the engine line-up used in SEAT's Ibiza supermini, which means that all of the powerplants on offer have direct injection and a turbo. There are three different petrol units to choose from, the headline emphasis being on the usual Volkswagen Group three-cylinder 95PS 1.0 TSI petrol unit, available in 95PS form with a five-speed manual gearbox or in 115PS guise with either a six-speed 'box or dual-clutch seven-speed DSG auto transmission. The third petrol choice is a 1.5-litre four-cylinder 150PS TSI unit with active cylinder deactivation technology, which is exclusive to the 'FR' trim and is connected to a six-speed manual gearbox. Go for that sporty 'FR' trim and you get dual-mode suspension and the 'SEAT Drive Profile' that allows you to alter the steering, throttle response and suspension feel via four modes: 'Normal', 'Sport', 'Eco' and 'Individual'. 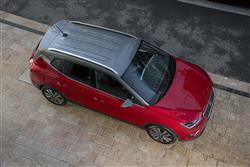 As for diesel options, the efficient and reliable 1.6 TDI unit is available with 95 and 115PS. The 95PS version can be paired with a five-speed manual transmission or a seven-speed DSG auto, and the 115PS variant with a six-speed gearbox. All Arona models are front-driven: there's not much appetite in this segment for 4WD. The Arona's sits on the same hi-tech MQB platform that underpins the latest Ibiza supermini and its styling follows the same structure as that used in the brand's slightly larger Ateca SUV. Here, that model's three-dimensional look is more pronounced, without being too aggressive. Like its rivals, this car is trying to give the feel of being a sturdy car for everyday life for the urban jungle, hence the strong protection in the bumpers, the wheel arches and the dark coloured rubber side skirts, as well as the roof rack and the aluminium look-like protection at the bottom of the bumpers. 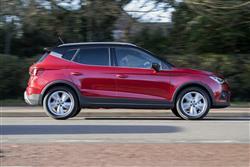 In terms of its dimensions, the Arona is 4,138mm long, which is 79mm more than an Ibiza. However, the real difference lies in its height, as the Arona is 99mm taller. As a result, this SUV offers not only higher ground clearance for any off-road adventures, but also more front and rear headroom, and, above all, a larger boot, with a 400-litre capacity. Another important feature is the seat cushion, which is 52mm higher and gives a dual advantage. Firstly, a higher driving position for raised view of the road ahead. And secondly, it makes it much easier to get in and out of the car. The passenger seats are also 62mm higher than they would be in an Ibiza, while headroom is 37mm greater in the front and 33mm in the rear. The suspension height has been increased by 15mm and the windscreen is slightly more vertical for a roomier interior. Arona prices start at around £16,500 but expect most variants to sell in the same kind of £18,000 to £24,000 bracket common to the two leading small SUVs, Nissan's Juke and Renault's Captur. Trim levels are based around the usual 'SE', 'SE Technology', 'FR', 'FR Sport', 'XCELLENCE' and 'XCELLENCE Lux' SEAT spec options. The Spanish brand knows that the extent to which buyers will be able to personalise the Arona and make it their own will be important. Colour-wise, the car is divided into two: the lower body on the one hand, and the roof (plus the A- and C-pillars) on the other. The roof can be grey, black, orange or the same colour as the body. Globally, there are 68 possible colour combinations. Key equipment features available as options or fitted to plusher models include Auto lights and wipers, a Keyless Entry and Start System, a rear camera, an 8-inch black panel centre-dash infotainment touchscreen, a Park Assistance System and a 'Connectivity Hub' which comes with a Wireless Phone Charger and a GSM signal amplifier. 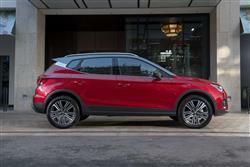 Safety spec will also be crucial to sales interest in this car, so the Arona gets all the latest camera-driven tech, including the brand's 'Front Assist' autonomous braking system, 'Blind Spot Detection' (which stops you from pulling out to overtake when there's a vehicle in your blindspot) and 'Rear Traffic Alert' (which warns you of approaching vehicles if you're reversing out from a space). Other features available include Adaptive Cruise Control, Hill Hold control, a Tiredness Recognition System and Multi-Collision Braking. 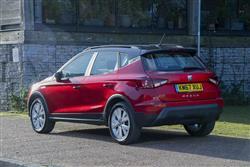 The headline engine is SEATs well regarded 1.0 TSI petrol turbo unit and it should certainly prove to be very frugal. Expect the 95PS version to manage over 55mpg on the combined cycle and under 110g/km of CO2. Obviously, the 1.6-litre TDI diesel will be much better. Expect about 70mpg and about 105g/km. All models get an automatic stop & start system to cut the engine when you don't need it, stuck in traffic or waiting at the lights. What else? Well there's SEAT's usual three year/60,000 mile warranty. That's unexceptional when rivals like Toyota and Hyundai offer five years of cover as standard and Kia offers up to seven years. However, the SEAT deal is extendable, so you might be able to negotiate on that. And it includes two years of Europe-wide roadside assistance. SEAT dealers also offer an 'It's Fixed!' low cost servicing programme. To even out the cost of regular maintenance, you can take up fixed price servicing packages for up to three scheduled halts and they go with the car when you sell it if the balance has still to be used. 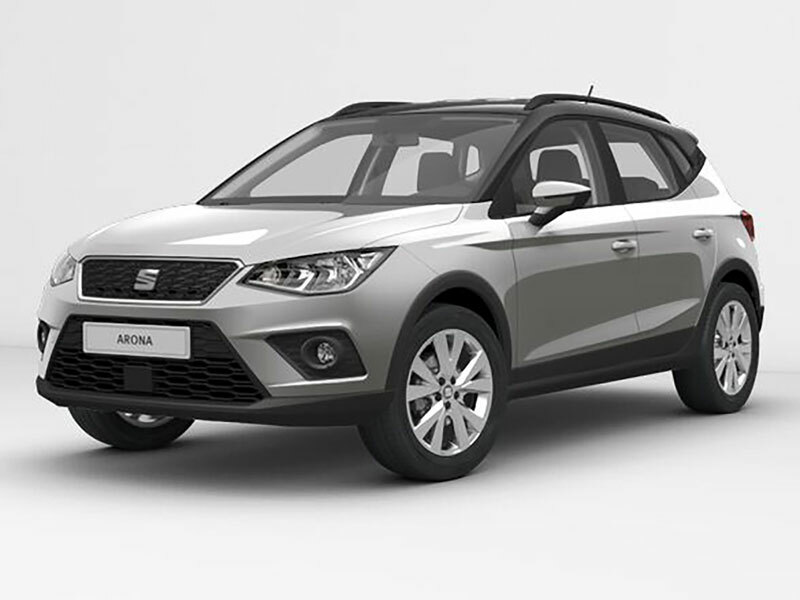 The Arona, says SEAT, is designed for 'drivers looking for a sense of excitement, distinction and functionality. People who know that age is just a number, not an outlook on life.' In other words, the people who've been busily buying Nissan Jukes and Renault Capturs in considerable numbers over the last five years. The Spanish maker wants in on this lucrative market and this little Crossover looks to have everything necessary to entitle them to a useful slice of sales in this segment. The potential for personalisation will be key to this car's prospects, as will the efficiency made possible by its efficient engines and light, stiff MQB chassis. It's taken some time for the Iberian maker to bring us a Crossover of this kind but we can see quite a few target Arona customers feeling that the wait has been worthwhile.